How to Enjoy 3D Blu-ray videos on Freefly VR Headset? 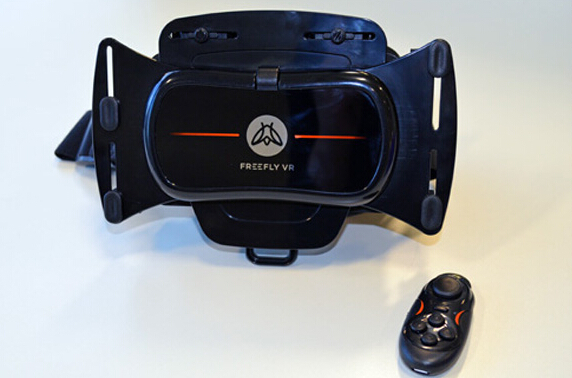 The Freefly VR is a smartphone adapter that allows virtual reality content to be experienced with the smartphone that most people already carry in their pockets. Within seconds of wearing the Freefly VR, you can be sitting in a fantasy theater, dancing through the clubs or touring exotic locations! Music videos, movies and games that can be downloaded from Google Play and the App Store are all pushing forward into virtual reality, offering 3D 360 degree worlds to explore. The lightweight device blocks external light allowing you to truly lose yourself in another world. After getting this great VR headset, chances are you want to view 3D Blu-ray movies with it. Well, this article mainly focuses on how to enjoy 3D Blu-rays videos on Freefly VR with smooth workflow. When it comes to playing 3D videos, Freefly VR requires either side-by-side or top-to-bottom (top down), but most Blu-rays are in the “frame packed” format. So the workaround is to download a 3D Blu-ray ripping program that can convert a frame packed Blu-ray to a SBS or TD. For 3D Glasses, 3D SBS MP4 is the most compatible format, including Freely VR. So you can choose to rip 3D Blu-ray to 3D MP4 for Freely VR via iPhone. To reach the goal, a Blu-ray Ripper is needed. Here, Pavtube BDMagic review>. With applying it, you can easily rip any commercial and region-locked 3D Blu-rays to 3D MP4/MKV for Freely VR as well as Gear VR, GOODO VR, Oculus Rift DK2, or other popular VR devices. What’s more, with the built-in editor, you can trim, crop, adjust special effect to your 3D Blu-ray videos, so that you can get the very part and effects at your will. If you are a Mac user, you can turn to Pavtube BDMagic for Mac (El Capitan, Yosemite included), which has the same function as the Windows version. Click “Format” to select an output profile. 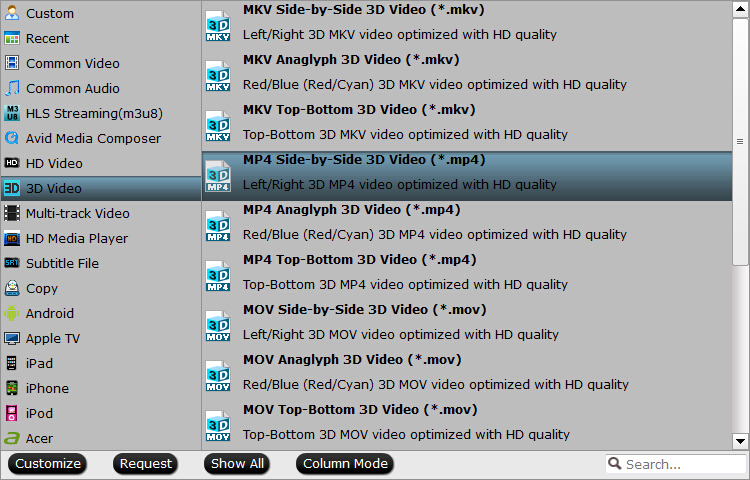 Here you can follow the path “MP4 Side-by-Side 3D Video (*.mp4)” for ripping Blu-ray to side-by-side 3D MP4 video. Tip: If necessary, you are allowed to adjust video and audio presets in Settings. Parameters like video codec, video bitrate, video frame rate, audio sample rate, audio channel, and more can be adjusted to achieve a better video/audio playback on Freefly VR Headset. An important issue that you must consider that in Freefly VR Headset, resolution for each eye is not Full HD but half the QHD screen. That is means a spilt VR resolution of 1280 x 1440 for each eye on Freefly VR Headset. It has a 60Hz refresh rate and a 96 degree field of view. Click “Settings” button to do corresponding settings regarding to video, audio. Plus, you can also select 3D Anaglyph like Left/Right mode. 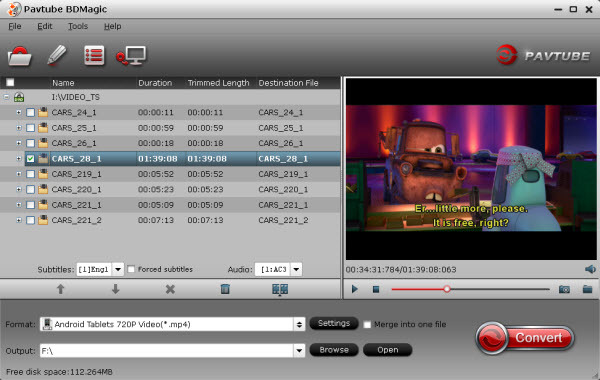 Hit the Convert button; this video converter will start to convert 3D Blu-ray to SBS MP4 files. After the conversion is over, connect the USB drive with computer and head to the destination folder where the converted files are stored and get them to Freefly VR headset for enjoyment using its Video Player app without any hassles. Now, just enjoy. Except for that last part which borders on the technical side, watching movies on your Freefly VR is a simple matter. All you really need to do is copy your movies in the correct folder and you’re good to go. How to Play Stereoscopic Video on Open Hour Chameleon Smoothly?